About 60 percent of the gains are going to shareholders, compared with 15 percent for employees. President Donald Trump and Republicans sold their $1.5 trillion tax cut as a boon for workers, but it’s becoming clear just two months after the bill passed that the truly big winners will be corporations and their shareholders, but perhaps not as big as people have been proclaiming recently. The latest evidence is buybacks, which are on track to have their best quarter ever. 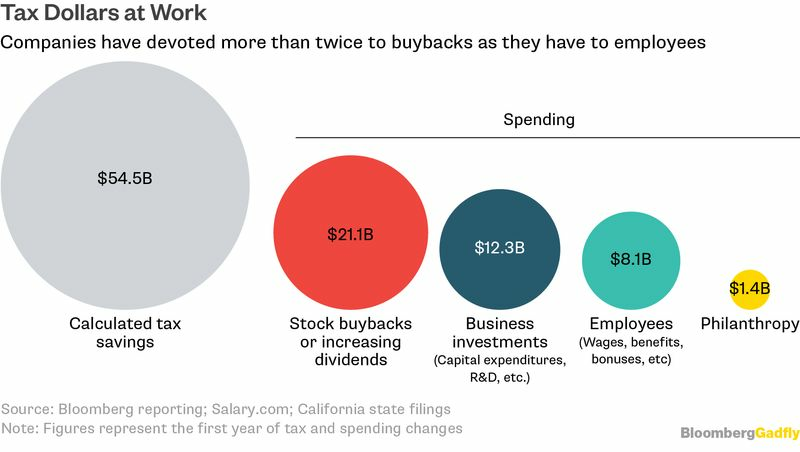 Kevin Hassett, chairman of the Council of Economic Advisers, says much of those buybacks are from overseas cash coming back into the U.S. He’s right, though Republicans argued that would boost wages and investment as well. Still, even stripping away the repatriated cash and looking just at increases in buybacks, investors and companies are still coming out ahead. 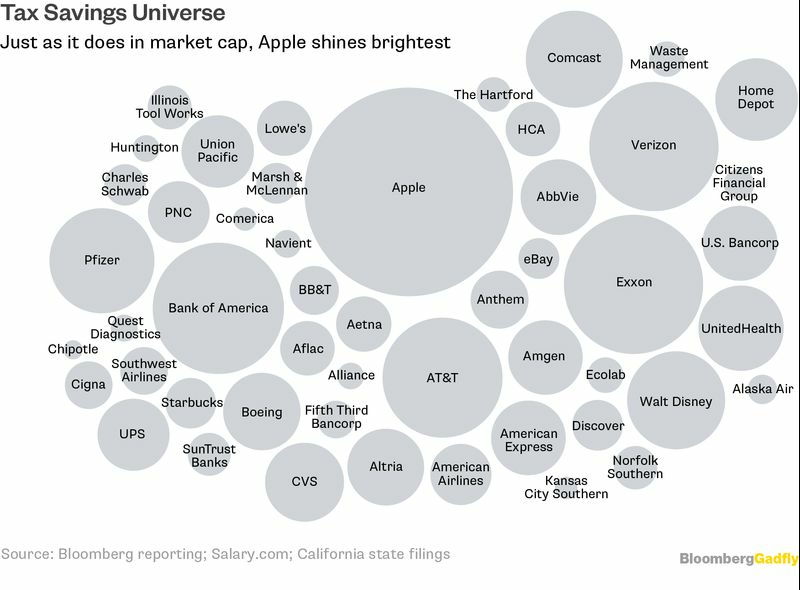 To determine what companies are actually doing with their annual savings — the biggest and recurring portion of the tax cuts — I took a close look at the announcements companies made after the passage of the tax law. I tossed out any companies that made vague promises and stuck to those whose plans I could fully quantify. I looked only at legitimate increases in spending. No credit for announcing buybacks or spending plans on the same scale as previous years, only to claim they were thanks to the tax law. I calculated tax gains using the companies’ three-year average tax rate and pretax profit. In most cases, where companies have announced savings, my estimate proved to be conservative, so the actual tax savings are most likely bigger. What I ended up with was a group of 51 S&P 500 companies, or roughly 10 percent of the index, and a pretty good picture of who’s benefiting the most from the tax bill, at least in the first year. 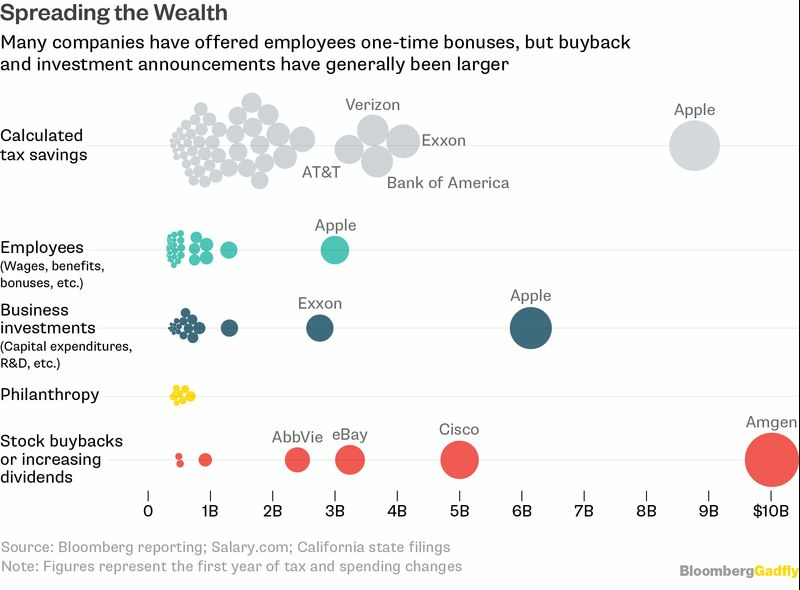 While more than half of the companies have announced one-time bonuses, and a handful have said they are giving out actual raises, those payouts have generally been small compared with announced buybacks. What’s more, most companies, even those that have detailed their plans, look to be saving more than what they plan to spend. There has been plenty of exaggeration and public relations spin in the tax announcements. Comcast Corp., for instance, said it would spend $50 billion over the next five years, which the company contends will create thousands of jobs, all thanks to the tax bill. Not so fast. That’s roughly how much Comcast has spent on capital expenditures in the past, long before the tax gains rolled in. 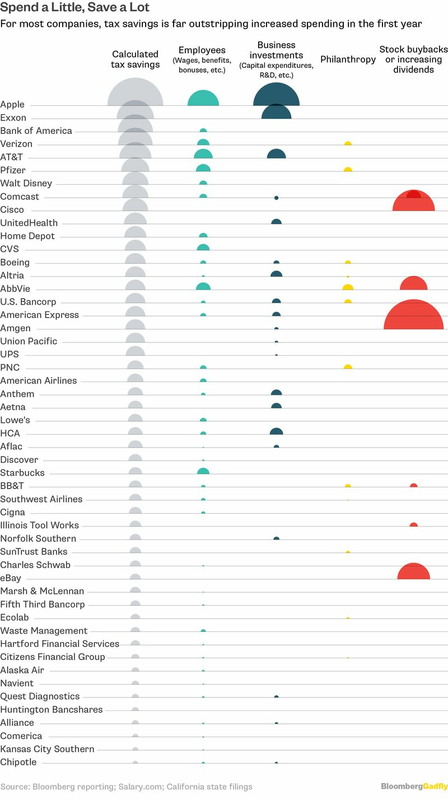 Overall, companies have announced plans for just less than 80 percent of their tax savings. 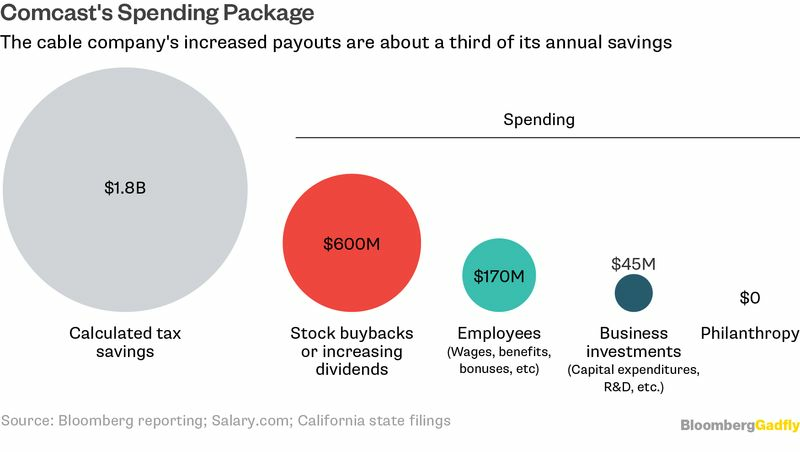 Add those retained earnings, which also boost the value of companies’ shares, to increases in buybacks and dividends, and roughly 60 percent of the gains from the tax bill are going to shareholders, compared with 15 percent for employees. That includes increases in benefits as well as salaries. Philanthropic pledges account for less than 3 percent.